Scientists have long known that the secret core of the atom concealed vast stores of concentrated energy. Evidence that man had unlocked the secret came with the atomic bomb. Then came the task of developing methods to release this unbounded energy slowly, gradually, in ways of lasting benefit to all of us. ISOTOPES AN EXAMPLE—When uranium atoms are split they emit a barrage of highly active particles. Certain chemicals placed in this barrage become radioactive and shoot off particles from themselves. Substances thus treated are called radioactive isotopes. When these chemicals are made radioactive their paths can be traced through plants and animals, showing the organs they affect. 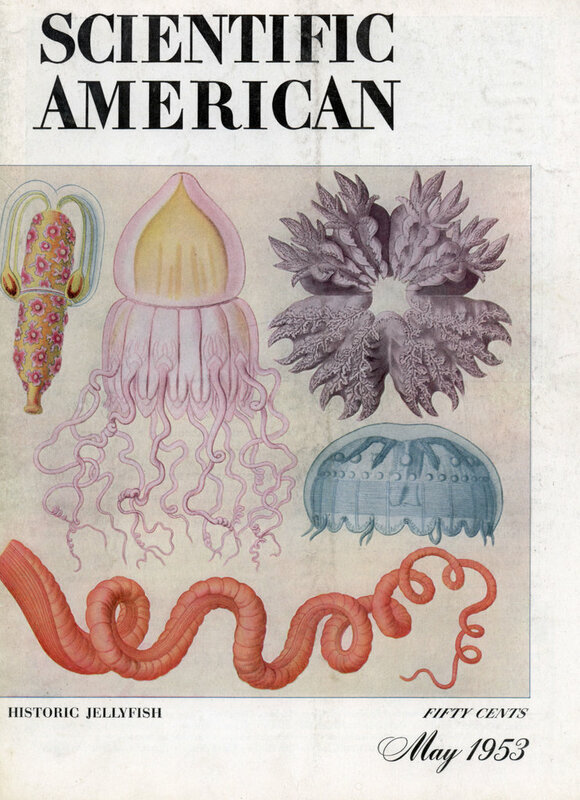 This may increase our understanding of the processes of life itself. FUTURE UNLIMITED —Atomic energy is also proving useful in industrial research and production. It promises to be even more valuable, however, in providing concentrated power for transportation, home, and industry. 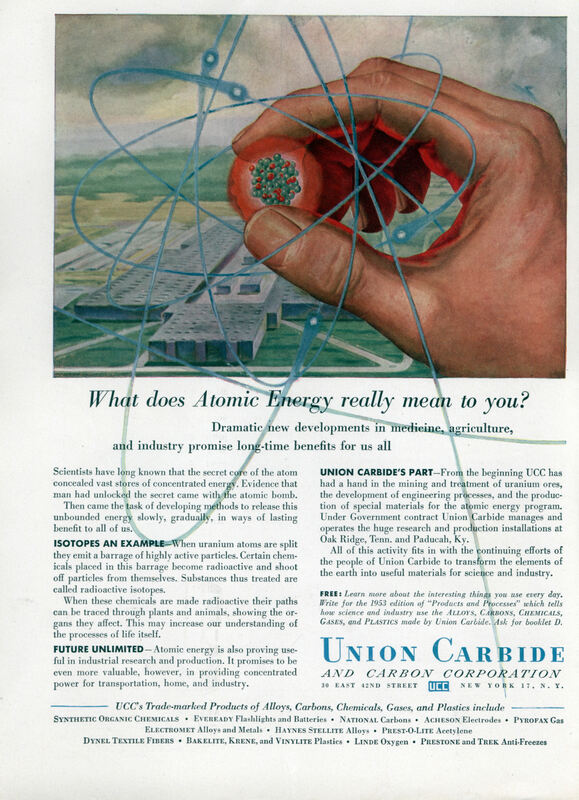 UNION CARBIDE’S PART-From the beginning UCC has had a hand in the mining and treatment of uranium ores, the development of engineering processes, and the production of special materials for the atomic energy program. Under Government contract Union Carbide manages and operates the huge research and production installations at Oak Ridge, Tenn. and Paducah, Ky.
All of this activity fits in with the continuing efforts of the people of Union Carbide to transform the elements of the earth into useful materials for science and industry. FREE: Learn more about the interesting things you use every day. Write for the 1953 edition of “Products and Processes” which tells how science and industry use the ALLOYS, CARBONS, CHEMICALS, GASES, and PLASTICS made by Union Car bide.. Ask for booklet D.
30 EAST 42ND STREET NEW YORK 17, N. Y.
Oh Noes!! The electrons are shooting through my fingers! The Oklo uranium mine in Gabon contains well known evidence of natural nuclear reactors, but how widespread were they? A team of researchers has proposed a scenario to account for the disappearance of a radioactive mineral from the geological record. Part of their hypothesis is that a surge of oxygen billions of years ago caused the creation of millions of tiny nuclear reactors. If true, this primordial nuclear age could have played a role in the evolution of early life forms.